Dragons of Tarkir is on the shelves! Buy, buy, buy! Actually, now is probably not the best time to buy. The availability of DTK singles is low, demand is high, blah blah economics. This is not the place to talk about Magic finance. This is the place to listen to a questionable source blather about Standard. For reference, I will talk mostly about decks that can be found here. Esper Dragons. Or UB Dragons. It’s the same deck, really. You can find deck lists and strategy advice elsewhere, but focusing on sideboarding guides and the split between Bile Blight and Ultimate Price misses an important point – why is the deck good? In old Standard, you could cast a two drop on the play and it would usually live to attack. By the time that Hero’s Downfall and Dissipate came online (turn three) you were already one threat ahead and your Fleecemane Lion / Seeker of the Way / whatever could get in some serious damage before Elspeth or Crux of Fate arrived to stabilise. No more! Now, on turn two Esper Dragons can play Counterspell (Silumgar’s Scorn), Ultimate Price or Bile Blight. Your Fleecemane Lions are no longer safe! Control gets to interact early in a meaningful way, so curves starting at two cannot necessarily get in underneath them. This suggests that you might want to play more one-drops, as in Brad Nelson’s Abzan Aggro deck. 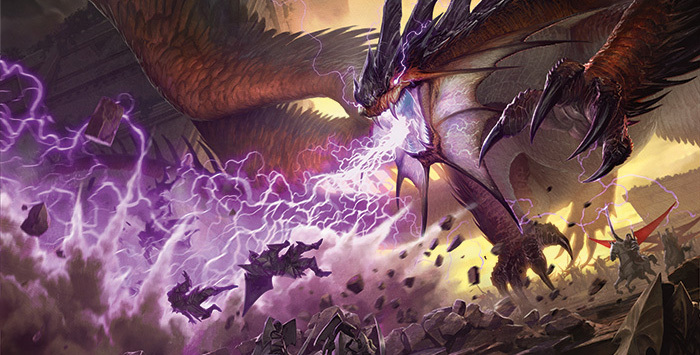 The dragons (Silumgar, Dragonlord Silumgar and Dragonlord Ojutai) turn Silumgar’s Scorn into Counterspell, gain life from Foul-Tongue Invocation, and turn Haven of the Spirit Dragon into a useful spell-land. This synergy is backed up by a lot of hexproof, which means that these Esper decks can afford to tap out for a threat as early as turn 5. This gives midrange decks a very small window to stick a threat. Once Ojutai connects, the game is very close to being over – a free Anticipate and a draw step gives the Dragons player a lot of cards to close the deal. This does exactly what is necessary to (sometimes) beat the Esper decks. They have good one-drops (Monastery Swiftspear, Lightning Berserker and Zurgo Bellstriker). Dragon Fodder and Hordeling Outburst embarrass removal not named Bile Blight, and combine with Atarka’s Command for a very quick clock. Then there is a swathe of burn spells to finish the game off. Tapping out for Silumgar looks good until the opponent fans out a hand of Stoke the Flames, Lightning Strike and Atarka’s Command. Defensively, deploying one blocker a turn often isn’t enough, especially on the draw. However, for every game that you kill your opponent exactly, they will survive several more on 1-3 life if you do not play perfectly. This is not as easy to play as it might look. For the best part of a year, Sylvan Caryatid, Satyr Wayfinder and Courser of Kruphix have defined midrange strategies. They block, provide mana and card advantage, and have been the cornerstone of Abzan Midrange, GR Dragons, various Green Devotion and Whip decks. However all of these look to be forced to the fringes of the metagame by Esper Dragons. Whilst it might take a while to catch on, the strength of the Dragons deck should not be underestimated. If your deck is weak to Counterspell like these are then you’re looking at some frustrating tournaments ahead. Whilst 4 of these decks made it to the top 8 of PTDTK, none made it to the finals, and there were a few Esper decks at 9-1 and 8-2 that missed the top 8! One week later in Krakow, there was 6 Dragon decks in the top 8, and two in the final. These are more relevant results than the SCG Circuit, because these events have the best players in the world using the best decks without card availability concerns. At PPTQs, Dragons will not see the level of play that it should. The cards are hard to get and people who dislike control will be less likely to pick it up, despite its absurd power level. So if you have the cards and the skills, Esper is almost certainly the deck for you to be playing. Various midrange decks are traps that can win against Red some of the time, but are likely to fall to Control. But enough people will be playing bad decks that you can likely top 8 a PPTQ with the same Abzan Control deck you’ve been playing since PTKTK. The bad news is that if someone else is in that top 8 with Dragons, you’re unlikely to win. If we ignore the realities of grinding PPTQs, or if it’s likely that a significant portion of the field will play the best deck (Esper), then picking up Red Aggro is a perfectly legitimate strategy. The prevalence of Foul Tongue Invocation, and the likelihood that Esper will be maindecking 3-4 copies of this going forward to win the mirror, mean that this is not a sure victory, but Red Aggro exploits the most obvious flaw in the Esper game plan, specifically turn one threats. If you don’t want to play Control or Red Aggro, you could just jam Devotion, Abzan Midrange or Jeskai Tokens and brace yourself for mediocre results. But there is a fourth option. 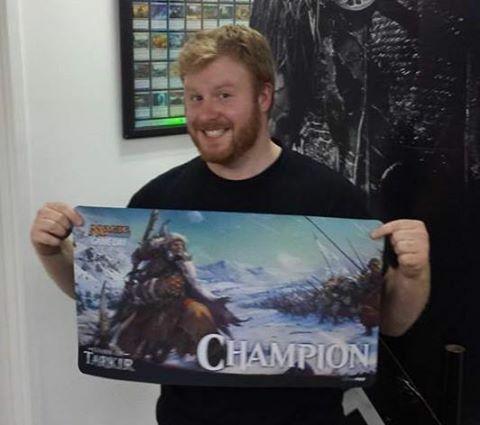 Craig Wescoe came tenth at PTDTK with an innovative Bant deck, and Sam Pardee took it to the top 8 of GP Krakow. Bram Snapvengers went 8-2 with a strange Gw Collected Company deck, which Antoni Del Moral Leon used to top 16 Krakow. Brad Nelson and Austin Bursavich went 9-1 and 8-2 respectively with Abzan Aggro. These deck all feature cheap and efficient threats which allow them to deploy blockers fast enough to overcome the Red decks. They also either have a sleek two-colour manabase or ways of gaining significant amounts of life. They also match up well against the Dragons decks. Wescoe and Snapvengers used the Den Protector / Deathmist Raptor engine to grind out card advantage. The Abzan deck is resistant to Ultimate Price, has access to discard after board, and two-drops that can survive Crux of Fate and Hero’s Downfall. They can also exploit a generally unseen hole in the Esper deck – its dual lands enter the battlefield tapped. Whilst a hand of Silumgar’s Scorn, Ultimate Price, Dissolve, Dig Through Time looks great, it is vulnerable to Fleecemane Lion, into Rakshasa Deathdealer – if it has two tapped lands. Sometimes getting UUBB (to play Downfall and Dissolve) doesn’t happen until turn 4, which mean that these decks packed with cheap and resilient threats can play 2-4 relevant creatures and only lose one of them to interaction. Furthermore, the flash creatures and instant spells in the Bant and GW decks allow the Green player to strategically bottleneck the Esper deck on mana by playing something like a Boon Satyr end step. These decks also all played Surrak, haste being not only great against Esper but for winning races against the midrange decks than can otherwise go over the top of them. Surrak may secretly be the most important non-Blue card in DTK, but right now he’s not seeing a lot of play. I think that this is the new midrange for Standard going forward – a much lower curve than Abzan, Devotion and Whip decks of the past – and matches up well against both Red and Esper. And as long as Esper gets played as much as it should (a lot) then these could be secretly the best decks in the metagame – they haven’t put up big results yet, but have come perilously close. Choose your deck wisely – DTK has severely disadvantaged former format heavyweights and settling on a poorly positioned deck will likely hurt you not just next week, but until rotation.